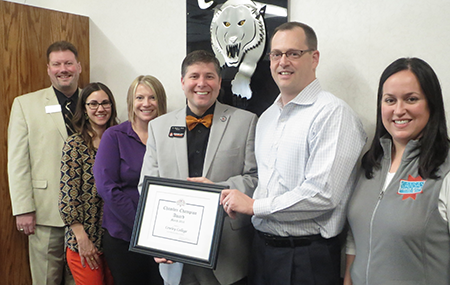 The Leadership Team from the Winfield Area Chamber of Commerce recently surprised Cowley College with the announcement and recognition of being awarded Chamber Champion for March of 2016 because of the school’s work with Rubbermaid. Each month, the Winfield Chamber’s executive committee chooses a chamber member to be recognized as the monthly Chamber Champion. This program was created in 2013 to recognize chamber members who have had great success, who have made outstanding contributions to the community, and who have encouraged their employees to volunteer with the chamber and other organizations. At the chamber’s annual meeting in January, all chamber champions from the previous year are recognized. Prior to the annual meeting, the chamber membership will have the opportunity to vote on the Chamber Champion of the Year from the pool of award recipients. Those pictured are, from left, Chamber Board Vice Chair Daniel YoNash, Chamber Board Chair Renee Price, Chamber Board past Chair Tonya Villar, Cowley College president Dr. Dennis C. Rittle, Chamber Board Chair Elect Mark Taylor, and Winfield Chamber CEO Sarah Werner.